WordStat 8 has amazing depth. It can easily display individual text segments, reveal synonyms for individual words (along with frequency counts), do a correspondence analysis, show frequency tables, and demonstrate how topics relate to other coded text or variables. Provalis Research announces a new version of its WordStat text mining software, which facilitates the process of generating important insight from text data in just seconds, no experience required. Most organizations store enormous amounts of unstructured data accumulating daily without a simple and efficient way to extract useful findings. Data scientists are in high demand but in short supply. Novice data analysts may lack the knowledge or skills of data taxonomy, coding, topic modeling and statistical methods that are instrumental for proper business intelligence. Recent industry surveys indicate that most data scientists gain their skills through self-learning rather than a traditional degree. 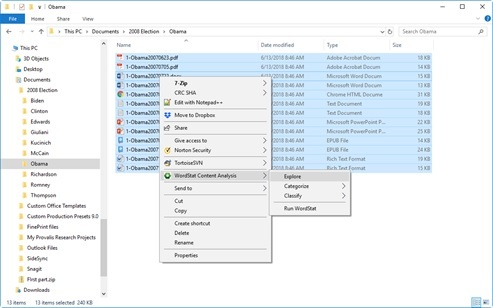 This new version has an Explorer mode allowing inexperienced users to quickly analyze many documents and identify the most frequent words, topics and phrases. In Explorer mode users may also apply a categorization dictionary to find specific themes. WordStat 8 uses a faster topic modeling protocol based on non-negative matrix factorization. It produces topics with words and phrases and provides suggestions for additional expressions, spelling corrections and potential exceptions for better measurement of concepts. With case sensitivity support, Regex pattern searches (Regular Expression such as email addresses or postal codes) or new substitution techniques, the customization and sharing of the categorization process is easier and more precise. "We have found WordStat to be the most powerful text analytics tool available for business applications. 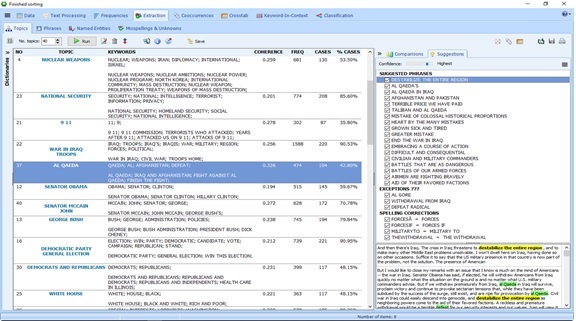 In addition to its comprehensive statistical reporting, graphics and machine learning capabilities, WordStat easily integrates with other applications to provide the combination of structured and unstructured data necessary for creating actionable insights," indicates Dr. John M. Aaron, President of Milestone Planning and Research, Inc. and Professor-Elmhurst College-Master's Degree Program in Data Science. WordStat exports text analyses to Tableau Software to prepare additional visual presentations. For better data visualization, WordStat 8 introduces new graphs such as donut charts, 100% stacked bar charts and polar charts. 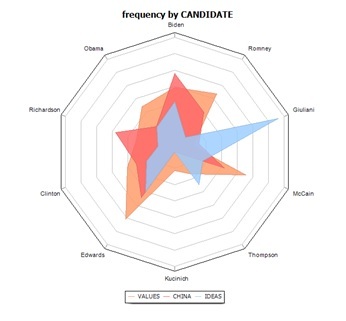 A new radar chart and improved interactive word clouds allow for quick assessment of the relationship between a variable and selected keywords or phrases. WordStat has an open interface with numerous solutions and directly imports and creates projects from Windows File Explorer, Excel, Word, PDF, Stata, CSV, social media, web survey platforms, and reference manager tools. To speed up the data analysis, WordStat 8 allows data analysts to pre-process or transform text documents using Python scripts. WordStat can still be run as a content analysis tool within QDA Miner, Stata or SimStat. “WordStat 8 has amazing depth,” says Dr. Grant Blank from the Oxford Internet Institute of the University of Oxford. “WordStat can easily display individual text segments, reveal synonyms for individual words (along with frequency counts), do a correspondence analysis, show frequency tables, and demonstrate how topics relate to other coded text or variables,” added Blank. To access the complete capabilities of WordStat you can effortlessly switch from “Explorer” to “Expert” mode from the main menu. 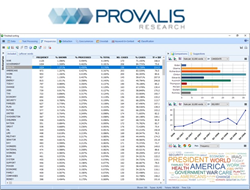 Provalis Research is a world-leading developer of text analysis software with ground-breaking qualitative, quantitative and mixed methods programs. Provalis Research has a proven record of accomplishment in designing and bringing to market tools that are essential to researchers and analysts worldwide. Headquartered in Montreal, Canada, the company was founded in 1989. Provalis Research products are used by more than 6,000 institutions on 5 continents, in a wide range of applications including business intelligence, market research, political sciences, media analysis, survey analysis, risk and fraud detection and international crime analysis.